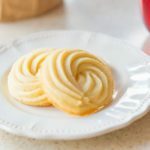 Butter Swirl Shortbread Cookies are a great Christmas Cookie for Holiday Baking! The dough is so easy to make and uses simple ingredients. These are a classic, crisp cookie. Place the butter, confectioner’s sugar and vanilla in a large bowl, and beat with an electric mixer until combined, light, and fluffy. Add the flour and mix until it’s crumbly and looks like it can’t be mixed more. Add the milk and keep mixing. The dough should clump together after about 15 seconds. Place the dough into a pastry bag fitted with a very large star tip, and pipe onto a silicone mat lined baking sheet, with no more than 12 cookies per sheet. Bake the cookies for 15 minutes or until lightly golden. Let them cool completely (on the tray is fine)***, and enjoy! *If using unsalted butter, add 1/4 tsp of salt with the flour. **Shortbreads are naturally thick and a more dry dough. If the dough doesn't come together, add another tablespoon or two of milk. Make sure to use a VERY large open tip for piping the dough, otherwise it will be too difficult to pipe it out. You can also use a cookie press instead, or even slice and bake. ***The cookies crisp more as they cool, so it's important to let them cool down for at least an hour.